Do you have a technical question or a problem in the field? Give us a call. Technical support can be provided over the phone or through remote access software where an internet connection is available. All borehole logging rental laptops are set up with remote access software. Our ground geophysics staff have seen many common issues arise as is the nature of geophysics and will help any way we can. As part of our technical support services we can service and repair your wireline equipment. Send it to our Mount Barker workshop or if it’s urgent we can come to you. Common spares for major ground geophysical products can also be supplied. 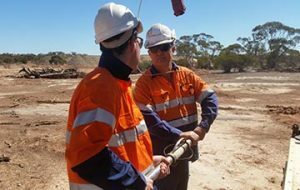 We provide hands-on training on all borehole logging hardware, either in the field or through formal training workshops at our facility in South Australia. Register your interest with us for workshop dates or to book a personalised training session on your own equipment. Ground geophysical system training is also incorporated with our technical team and manufacture specialists. WellCAD is a powerful borehole data processing package that can utilise data from a wide variety of geophysical, geological and geotechnical sources. We provide WellCAD training tailored to your specific needs. Purchasing a new logging system? We can commission your equipment, providing testing and calibration at our facility and specific training for your operators. Training can be undertaken at our facility and/or in the field. We have experienced wireline operators available for hire to cover your staff shortage or to assist on those more challenging jobs. Our operators are accustomed to lateral thinking to get the best results from even the most unconventional jobs. Send us your wireline data for review using WellCAD. Our experience in the mineral, geotechnical and water industries combined with our in-depth knowledge of the software can greatly assist your needs. See our Borehole Data Services page. Check back here for updated papers or contact us if you would like to include your case study.